When I first read Confessions of a Shopaholic fourteen years ago, I instantly fell in love with Becky Bloomwood. She was two parts Lucille Ball, one part…well…me. I found a kindred spirit in the feisty heroine and completely understood the importance she placed on that Denny & George scarf. A decade and a half and seven books later, I adore Becky more than ever, and with Sophie Kinsella’s latest release, Shopaholic to the Stars, it’s like catching up with a friend I’ve missed desperately. Shopaholic to the Stars follows Becky and her husband Luke (sigh, Luke!) to Los Angeles, where Luke is doing PR for A-list celeb Sage Seymour. In classic Becky form, our favorite big spender cannot contain herself and has grand ideas about becoming a celebrity stylist and hanging out with Oscar winners. Through a sequence of hilarious, page-turning events, Becky finds herself on the verge of the spotlight she always dreamed of, discovering that it’s not exactly everything she imagined. The book is every bit as funny and un-put-downable as the rest of Becky’s adventures, and with even more heart, if possible. With each installment of the Shopaholic series, Becky’s responsibilities and inner circle continue to grow, putting more and more at stake. The girl who was once a single twenty-something living with her purse-making flatmate is now a wife, mother and daughter-in-law. She still fibs and overspends, but where her most severe consequences were at one time credit card debt and calls from bank manager Derek Smeath, her actions are now putting much more at risk—her marriage, her bond with her best friend, even her relationship with her parents. There are times when I want to jump through the page and say, “Bex! What are you doing? !” but I never stop rooting for her, I never stop adoring her, and I never stop believing that everything will be all right in the end. No one can do funny quite like Sophie Kinsella, and in the moments when Shopaholic to the Stars didn’t have me on the edge of my seat or reaching for a tissue, it had me snorting with laughter. Becky’s thought process—from justifying a purchase of exercise-wear to swearing that she sees Tom Hanks—never fails to make me laugh out loud. Whether she’s chasing down a shoplifter, searching for celebrities during a ten-mile run, or making a bit too much noise as a movie extra—er, background actor—Becky is always in the thick of a scenario reminiscent of I Love Lucy. The characters we’ve come to know over the course of the series are as quirky and lovable as ever—especially Becky’s husband, Luke, who doesn’t understand the appeal of celebrities, and who is more or less the dreamiest dreamboat ever. 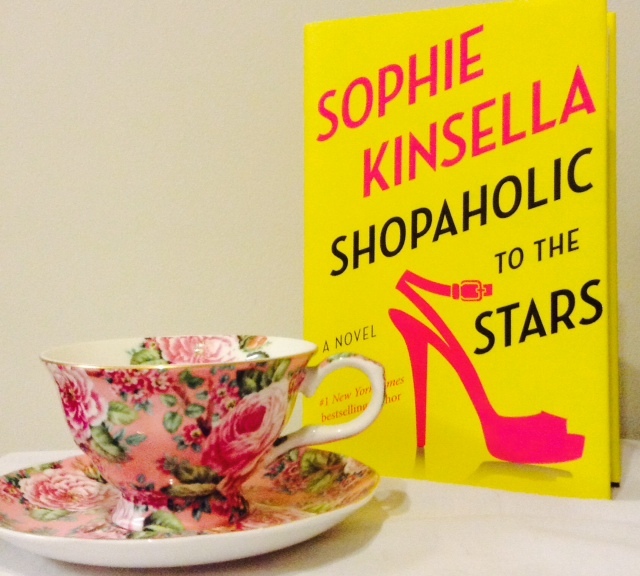 If you enjoyed the rest of Sophie Kinsella’s wonderful novels, you will absolutely devour Shopaholic to the Stars. If you haven’t read the books before and are in the market for a funny, heartfelt read, start with Confessions of a Shopaholic, and you may very well find yourself plowing straight through the entire series over the holidays. Becky Brandon (née Bloomwood)’s fun-filled journey of shopping, loving, growing and shopping some more is a sheer delight. These books beg to be read and re-read again and again. I can’t wait to see what Becky will be up to next. These books sound delightful! I’ll have to add them to my Christmas wish list. Becky cracks me up. 🙂 After watching the Mindy Project, I’ve noticed how similar Mindy and Becky are. You’re right, Melissa! Imagine Mindy and Becky hanging out?